Seems odd, doesn't it, that a machine that spends its life washing dishes would get so grimy. Soap scum starts building up, and sometimes we aren't good about rinsing before we place dishes inside. Baking soda and vinegar to the rescue! First, take out the filter and soak it in some dish liquid. After it has soaked, get a soft toothbrush and give it a gentle scrub. Put it back, and get out the vinegar and baking soda. Pour a cup of vinegar into the bottom of the dishwasher, and run it through a cycle. That should eliminate the rest of the gunk. If you still have odors after that, sprinkle a little baking soda in the bottom of the dishwasher, let it sit, and then run a cycle again. This morning, I set off the smoke alarm while attempting to make my toast. That was a really good reminder to clean the toaster. Ever cleaned a toaster before? It's not hard, but there are some important steps. Watch the moves of this toaster-cleaning pro here. Butcher blocks can be a beautiful part of your kitchen. They're even collectible now, so take heed and keep yours clean. Butcher blocks need maintenance and frequent cleaning. Daily maintenance should include spraying with vinegar and wiping them down. For more stubborn stains, clean your butcher block using some natural cleaning tricks. Ever get those rust spots on knives? Combine equal parts warm water and lemon juice in a cup. Put in your rusty knives, soak for 10 minutes, and rinse; dry with a kitchen towel. If you love your knives, please don't put them into the dishwasher — wash by hand, carefully. It never hurts to wash the carafe and filter basket in warm, soapy water after use. You should also periodically wipe up spills on the heating element. But then, there is that water reservoir, which really needs your attention. It's a favorite hangout for yeast, mold, calcium deposits, and other gross stuff. Put a filter into the basket, and then fill the reservoir with equal parts of water and vinegar. Hit the "on" button, and let it run. Stop the machine, and let it sit for 30 minutes. Then, turn it back on, finish brewing, and pour it all out. Rinse by running water through another brewing cycle. For a grimy blender, fill halfway with hot water. Add a drop of dish soap. Cover with lid, and hit the "on" button. Blend for 30 seconds and then pour out the soapy water. Add more hot water (halfway) and blend again two or three times to rinse. All of those splutters and spills add up in the microwave — an oft-forgotten appliance to clean (and they are usually the worst in offices). Pour a cup of vinegar into a two-cup glass measuring cup. Add a cup of water and microwave for 10 minutes. Let it steam up the microwave for another 20 minutes, then wipe it all out with paper towels. Think about where those bags have been, and you'll realize... Yuck. Hopefully, you have the kind that you can toss into the washer, because odds are, they're harboring bacteria and possibly E coli. Baking soda works about as well as chemical cleaners, and it's so much safer for the environment. Use as you would a powdered cleaner. For really stubborn stains, add salt to the baking soda, and try a natural-bristle brush to scrub. If you own a self-cleaning one, you're good to go. Although you may want to read up on some of the issues associated with actually using that feature, due to the high temperatures. What about the rest of us (me, included) who have gas ovens, or non-self-cleaning electric ovens? 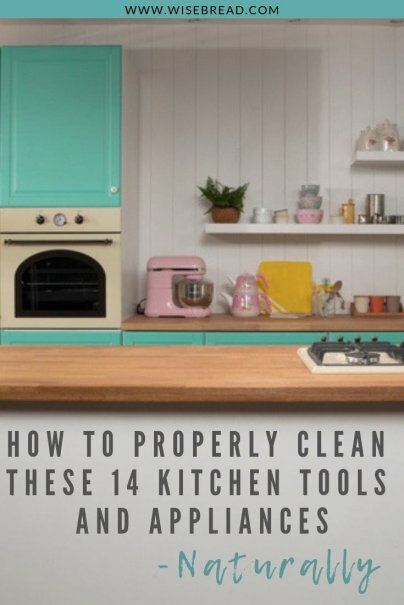 There are natural ways to clean ovens using things like vinegar and baking soda. However, a caveat: Check your manufacturer's manual. If you cannot find your manual, look up the brand online, where most manufacturers have PDFs of manuals posted. Also, what may apply to electric may be downright dangerous with gas. If you have gas, you have to turn off your pilot light and the gas before cleaning. Don't use dishwashing detergent, which may leave an odor on your food. Instead, use baking soda and hot water. Remove racks, wash, and rinse. Wipe down all the walls of the refrigerator and dry before reinstalling racks. Don't forget to remove the drawers and wash those, too. You've probably heard that your kitchen sponge is dirtier than your toilet seat, but in case you didn't, throw your sponge out. Get a new one. Once that has been accomplished, sanitize it regularly. Get it wet, and toss it into the microwave for a minute. If you have a dishwasher, you can run it through the longest and hottest cycle. Lastly, try soaking it in a solution of bleach and water (½ teaspoon per quart of warm water) for a minute. If you use dishrags, use a fresh one each day. I use my insulated bag every week when I load up my groceries. Yesterday, however, I went to pop in the grocery bags, only to discover that meat juices had previously leaked. Yuck! I turned that bag inside out, washed with hot, sudsy water, and left it outside in the sun to dry thoroughly. The best way to avoid having to attack gunk buildup on your mixer is to wipe it down after each use. I just use warm water and a damp dishcloth. For those tough areas, try an old toothbrush and a little plastic scraper (so as not to damage the finish). A little baking soda on a toothbrush does wonders. Be sure to rinse and dry.